Meet Cathy - a local Santa Rosa mom and stellar authoress of "Waldorf Modern." "Curated by Cathy, mom to two daughters and wife of a computer programmer. Z is 8, and Bean is 4. We have a mid century ranch house, a garden in the back, and Waldorf modern inside." Cathy's modern perspectives, humor, and visual insights of the traditional Waldorf world captivate readers and inspire many to explore integrating Waldorf philosophies and parenting in current times. With article posts ranging from topics such as interesting reads, hand crafts with children, to creating a rhythmic weekly meal plan, juicy tidbits abound. Top that off with Cathy's decorating style - featured on Soule Mamma and Apartment Therapy, and you'll find yourself hitting her "subscribe" button. I invite you to sample "Waldorf Modern" today through Sono-Ma's first guest blog post. Read on and allow Cathy to inspire you to discover Kim John Payne and his renowned parenting philosophies. "Kim John Payne in Santa Rosa March 23"
Summerfield Waldorf School in Santa Rosa is hosting a talk from Kim John Payne the evening of March 23. 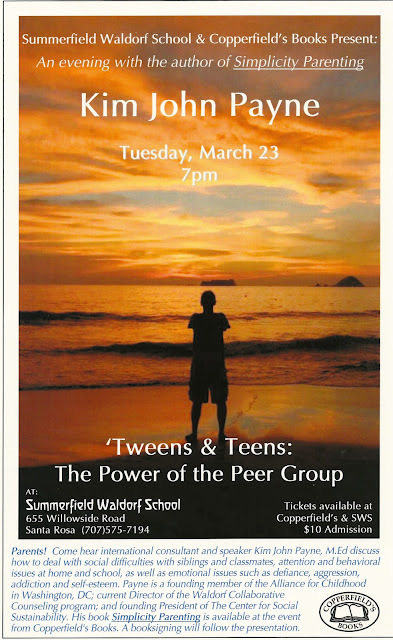 This year he is speaking about Teens and Tweens: The Power of the Peer Group. Even though my children have a ways to go until they are teenagers, I will be attending. Oh no, my oldest is almost a 'tween.' Heaven help me. Tickets to the event are $10 and available at Summerfield or Copperfields stores. Copies of Simplicity Parenting will be available at the event, and a book signing will follow the talk. I have had the pleasure of hearing Kim speak at Summerfield the last couple of years on Simplicity Parenting and the Soul of Discipline. The last talk was so packed, I sat on the floor. His calendar lists his speaking engagements, so if you are not in the vicinity of Sonoma County, I hope you can find another talk to attend. If not, audio cds of his talks are available for purchase, and other audio interviews and articles are listed on the new Simplicity Parenting site. Check out Kim John Payne's site for specific, immediate tips you can use such as his five steps for simplifying! Then be sure to wander over to Cathy's blog for more great Waldorf resources including: "Links: Waldorf Web Resources" You'll find thought provoking and practical tips with both Waldorf Modern and Kim John Payne. Chickens delight in the light - we make the most of fresh eggs and farm days! February 28, 2010 update: The Leras Family plans to sell chicks in coming weeks! 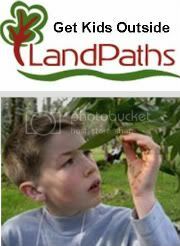 Call for more information at (707) 578-0779. Santa Rosa hit 70 degrees just a few days ago, with the warmth lasting far into an afternoon that could easily be described as summer-like. Well beyond five o'clock, the sky remained bright causing a great buzz of activity. Families strolled by our court later in the evening, squirrels skitted with intensified fervor and chickens across the county laid bounties of eggs! While winter's short days and long periods of darkness can cause egg production to decrease, the welcome longer days of approaching Spring create happy chickens. One lucky week we received three dozen eggs from farmers suddenly finding themselves with surplus. While visiting our friends the Kaisers at Singing Frogs Farm to welcome their newborn daughter, we took a short walk to enjoy the fresh air and survey the budding farm. 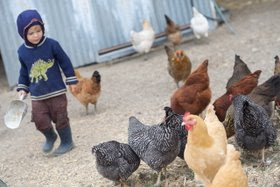 Our toddler boys raced to the chicken coop to search for eggs and sprinkle scratch, while we adults talked about the exciting plans for this year's Community Supported Agriculture program. In between bringing their new wee one into the world, the Kaiser family also laid out cherry tomato starts and a host of other plants to share with our family and other share holders. Our bushel deliveries begin on May 12, but the chickens will be producing enough eggs for the Kaisers to have plenty to sell or share long before then... They sent us home with a gift of two dozen eggs as they are already struggling to find ways to put the chicken's cheerful production to good use. Just days later, we visited with our friends the Leras Family who provide us with raw milk through our cow share membership. They too found themselves with a sudden surplus of eggs and ensured we walked home with another dozen. Later that afternoon, neighbor Sharon Eisley, stopped by with a tiny basket and cloth covering three blue eggs - the first delivery since Fall. Last Spring we co-opted into to Sharon's chicken coop project and purchased "Chicky" an Araucana chicken which lays blue eggs - at least during the time of year with brighter, longer days. We were pleasantly surprised by Chicky's returned desire to lay, and didn't dare mention our growing egg surplus to Sharon! Now... what to do with all these eggs? First and foremost, I wanted to make a batch of fresh mayonnaise. Fresh eggs aren't the only benefit to raising chickens or supporting farmers who do. My little guy has a huge hankering for hens and their "eggcentric" personalities. We love reading chicken stories - Jan Brett's Daisy Comes Home is a favorite - and visiting our friends' backyard coops. Looking for your own source for fresh eggs? Michele Anna Jordan wrote "Where to find the best eggs", which the PD featured last year. No crowing! Just happy, healthy laying hens"
While sadly Dawn and Ranch Hags are not selling chicks this year, she offers important tips for how to ensure you get ethically treated, healthy chicks. Try to find chicks from local providers - with a reputation for knowing how to properly vaccinate chicks for Merrick's disease - such as craigslist or a local 4H group. Try to buy chickens that are 3 - 14 days old that don't have crooked beaks, bent toes, featherless bottoms, or "poopy" bottoms. 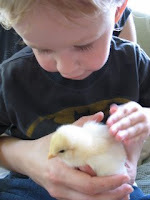 Carefully follow tips (See Ranch Hag's How it Works page and scroll down to Day Old Chicks) for bringing your chicks home and allowing them to settle - little chicks are easy to fall in love with as they are ultra precious and fluffy. However, they also have a huge rate of loss. For more great chicken raising tips, follow Dawn Russell of Ranch Hag Hens (a self-described chicken fanatic). This local Petaluma mother is now focusing on writing a book about raising chickens while selling "chicken treats." Find your own chicken inspiration as well as homeopathic, flower essences, and coop cleaning products at her "Treats for Chickens" site. While chicks need to live in a controlled environment - say a cardboard box with a warming lamp on your kitchen table suggests Dawn Russell - older chickens will likely need a coop and or chicken run for protection, nightly roosting, eating, and egg laying. 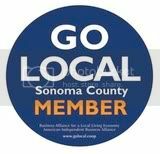 Visit the Santa Rosa Farmer's Market and find our local recycled wood chicken coop vendor or call Mack at (707) 481-1145 for one great coop resource. Need a little meal preparing inspiration? Check out this Sono-Ma special article here! Summerfield Waldorf High School Production "Most Happy Fella" Most Perfect Valentines Date! The intimate Sophia Hall offers supreme, “unplugged” amplification and the perfect setting for a Valentine’s Day date. Tickets for the show are $10 per person, with childcare available on Sunday (by reservation) for just $5 a child. Students will sell baked goods and tea at intermission. The last three showings are scheduled for Friday (7:30), Saturday (7:30), and Sunday at 2:00. Call the Summerfield school office at (707) 575-7194, x 100 for your tickets today! Wherever this show landed in history, its lyrics managed to permeate popular culture. Dean Martin ensured that most people know the tune to “standin on the corner watching all the girls go by…” Today’s Summerfield High School production is sure to have you singing along too! Come out to judge the students’ performance for yourself. Your heart is sure to flutter as lead actor, 18 year old Sela Shiloni, declares his love for Rosabella in a rich Italian bravado. It’s no wonder he’s already received an offer to attend the American Academy of Dramatic Arts in Los Angeles, and may soon hear from the California Institute of the Arts. Other on-stage talent includes Sela’s friend Max Allen, who aptly plays Herman the comedic cowboy. Allen easily finds his footing on-stage through his experience as the lead singer in a local teen band. Lidia Tropeano, cast as Rosabella, has the pure, lovely voice of a bird twirling for spring. Many of these roles are double cast by other talented members of the high school. For example Ruben Steinegger, a German exchange, proves his language mastery as he alternates with Sela to play e Italian-speaking lead role! Kathy Foley, former Hollywood make-up artist, styles the students in 1920’s slick, cropped hair styles. One young man, Paxton Miller-Fitzpatrick gave up shoulder- lengthed hair to better assume character with such a cropped cut. With help from the 6th Street Playhouse, Sonoma State’s Costume Department, Hot Couture and Saddles to Boots, the students tap across the stage in heeled Mary Jane’s, shaggy flapper dresses, cowboy boots, suspenders and other uthentic garb that dramatically (pun intended) bring the production to life. Call the Summerfield school office at (707) 575-7194, x 100 for your tickets today! Travel out the scenic Bodega Highway and find a tiny gem in the valley that lies on the edge of the Sonoma Coast: the quaint hamlet of Bodega Bay. Forever famous for serving as Alfred Hitchcock’s the Birds' film set, Bodega Bay is home to a handful of charming antique stores. Bodega also has its very own Artisan's Cooperative where a hand painted sand which board calls out “Meet Today’s Artist”. Venture into a clapboard cottage and awe over the unique works of local artisans, including German doll maker Christine Schreier. Christine’s dolls demonstrate fine skill and profound intention, earning recognition of the highest order among craftspeople. Christine believes that a doll can be many things to different people. For a child, the doll is also a child – offering an opportunity for children to practice mothering or fathering by nurturing and caretaking. Following this belief, children only need one special doll as it is nearly impossible to parent dozens of “children.” An elderly person nearing the end of their days, may also relate to certain dolls. Knot dolls, or those with floppy limbs and a large head may reflect an elder’s form who finds while his mind may still be sharp, he has lessing control over his limbs. In one elder’s case, holding a doll provided comfort while moving through the process of dying. Handcrafted in the Waldorf tradition, Chirstine creates gnomes, finger puppets, and forest folk. Her dolls are “suitable for any age, from the very young, to the young at heart.” Created using bits of recycled cashmere sweaters, sheep’s wool stuffing, and finely knit exotic yarns and colorful threads, Christine Schreier’s dolls exude a tangible, ethereal quality which calls on you to pause and pick one up. Each piece is hand sewn or knit and embellished with her trademark crocheted collars and touches of embroidery. While finding a doll that speaks to your soul is best done in person, such as by visiting the Artisan's Cooperative or finding Christine vending dolls and fine knittery at one of the many local Waldorf Faires, Christine recently made her dolls available through Etsy and her on-line Puppenstube (German for doll house) store. Her dolls make excellent gifts for all! In fact, you can support Christine's work and join in her noble efforts to generate funds to support Haiti by purchasing a Valentine's Doll for your sweetie today. See enchanting Valentine dolls here and give the double gift of helping others and surpising someone you love with a truly special doll. Many respond to more than just Christine’s hand work. “My dolls speak to people’s souls by connecting to an innocence and reminding us of a gentler time.” Christine intentionally keeps her dolls form and expressions simple, crafting what she describes as a pared down "gesture of love" into the shape of the body and arms. As an artist, she puts a bit of her own spirit into everything she crafts - and what a strong spirit she has! Honoring her self proclaimed gypsy blood, she lives with humble materials means, but enjoys the riches of a free conscious and purposeful living. For 30 years, Christine has found ways to survive and thrive while keeping to her doll maker’s path. While Christine may live a modest life – at times making a home for her family in tiny spaces such as a yurt or converted garage - she’s also managed to travel back to Germany, spend a year living as a part of a Russian Anthroposophical Community, and attend Waldorf-inspired conferences such as an upcoming event in Hawaii. Those discovering Christine and her dolls are often fascinated with her creations and personal story. First featured in the original Ark Toy Store, today she’s enjoyed sharing her crafting with national audiences through renowned publications such as Living Craft. See her forest people or star baby pattern and more in past Living Craft issues. Others proclaiming Christine’s magic, including the Berkeley Waldorf School who works with Christine to offer doll making classes, A Small Tribe blog, and the and Waldorf Mama blog. Driving home with a delicate, winter girl finger puppet in my lap, I found myself reveling in Christine’s magnetism. I clung to the little angora puppet and tried to imagine it healing me… or at least passing on some of Christine’s impressive consciousness. After all, I’d like to preserve what’s left of some of my own childlike wonder and awe for life. I’d like to make a living doing what I love. So, I’ll keep this little doll near me to remind me of what Christine shows is possible! Visit the Bodega Artisan's Coop to marvel over Christine’s works. Then wander about the store to see hand-crafted leather boots (sure to knock the socks off your Ugh’s), felted caps, hand-spun yarns, sterling silver necklaces, paintings and more. You’ll be glad you made this stop, and be sure to return again for more Artisan Coop discoveries on future journeys to the Sonoma Coast.